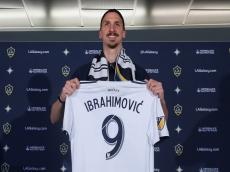 Zlatan Ibrahimovic has signed a new contract with LA Galaxy that ties him to the club for the 2019 MLS season, according to goal.com. The former Manchester United, Paris Saint-Germain and AC Milan forward will become a Designated Player for the upcoming campaign, meaning the Galaxy will have to buy down or sell either Giovani dos Santos, Romain Alessandrini or Jonathan dos Santos. The Swede took to Twitter on Monday to confirm that he would return in 2019 while also firing a shot at his doubters in his typical fashion. Ibrahimovic scored 22 goals in just 27 MLS appearances after joining from United last March but was unable to guide the team into the playoffs. "We are very pleased to sign Zlatan to a new contract that will see him return for the 2019 season," said Dennis te Kloese, who was appointed general manager last week. "He showed his value last season and we look forward to him representing our club next year. With Zlatan returning, we will continue to improve our team in advance of the season." The forward had previously been linked with a return to AC Milan, but manager Gennaro Gattuso says that, although there was "a chance", he never spoke with the forward. The Swede was named LA Galaxy Player of the Year, won MLS Newcomer of the Year and earned a spot in the league's Best XI.